On Thursday, October 22nd, a group of AP Spanish students traveled to Tijuana, where they had the opportunity to practice their language skills and engage in cross-cultural dialogue while visiting two local schools. The students' first stop was a kindergarten in Colonia Fausto González, a community that formed amidst the refuse of the former Tijuana Dump. 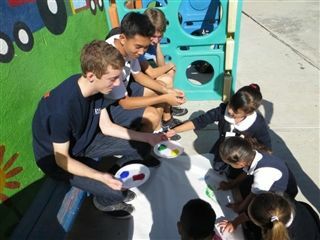 There, students led the children in art and music activities and games. Next, the group stopped at Centro de Enseñanza Técnica y Superior (CETYS), one of Tijuana's top high schools and universities. Students toured the campus and had conversations with their CETYS peers about life on both sides of the border.